I think that when you first approach a piece of art, and you imagine it and draw it, there’s a sense that it will always remain somewhat in your imagination. Its only when you take the 2D object and re-work it into the physical 3D world that it becomes somewhat more real. It no longer just exists in your eyes and mind, but instead has to react with the floors and walls around it in the physical world. For me, kinetic art highlights the importance of bringing both inventions and imagination into a physical existence. Are any of our UK readers going? Please do report back! It sounds amazing. 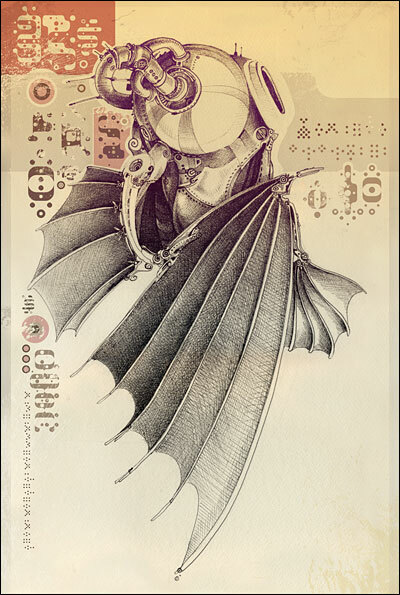 Eiko Ishioka, Motoko Narsue, Kyoko Inui, poster 1979. Photographed by Kazumi Kurigami. Ms. Ishioka won an Academy Award for costume design in 1992 for “Bram Stoker’s ‘Dracula,’ ” directed by Francis Ford Coppola. Her outfits for the film included a suit of full body armor for the title character (played by Gary Oldman), whose glistening red color and all-over corrugation made it look like exposed musculature, and a voluminous wedding dress worn by the actress Sadie Frost, with a stiff, round, aggressive lace collar inspired by the ruffs of frill-necked lizards. These typified Ms. Ishioka’s aesthetic. A deliberate marriage of East and West — she had lived in Manhattan for many years — it simultaneously embraced the gothic, the otherworldly, the dramatic and the unsettling and was suffused with a powerful, dark eroticism. Her work, whose outsize stylization dazzled some critics and discomforted others, was provocative in every possible sense of the word, and it was meant to be. 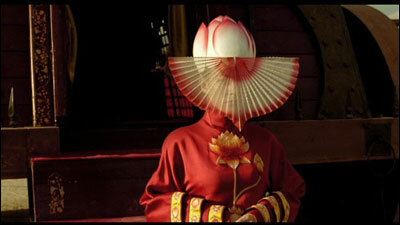 Ms. Ishioka was closely associated with the director Tarsem Singh, for whom she designed costumes for four films. 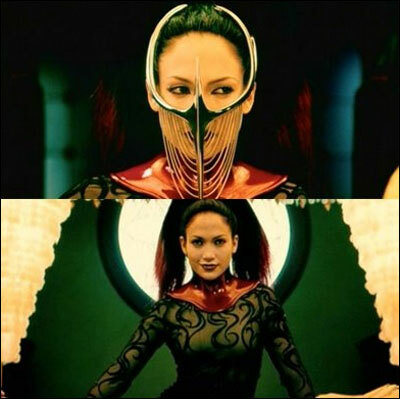 In the first, “The Cell” (2000), she encased Jennifer Lopez, who plays a psychologist trapped by a serial killer, in a headpiece that resembled a cross between a rigid neck brace and a forbidding bird cage. 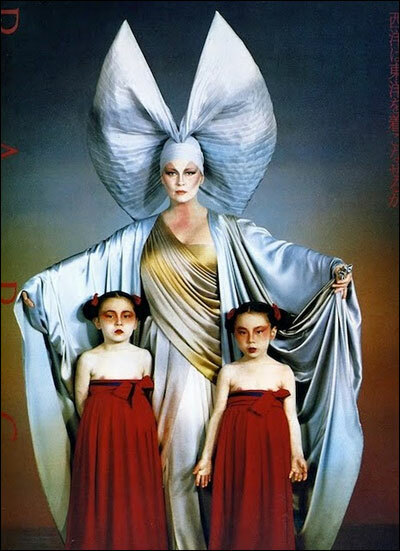 Eiko Ishioka worked until the very end of her life. Her latest works can be seen in Tarsem Signh’s Immortals (2011) and Mirror Mirror (2012). After the cut, more images of Ishioka’s work throughout the ages, as well as recent video of her talking about her work on Immortals. Next Wednesday, February 1st, professional musicians/married couple/doting parents Carla Kihlstedt and Matthias Bossi –whose various other projects have been mentioned on Coilhouse many times— are launching a very interesting new multimedia musical subscription service called Rabbit Rabbit Radio. 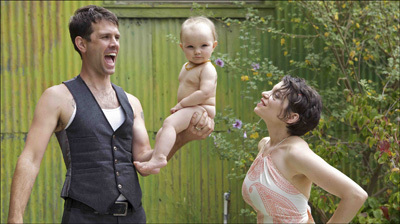 The Kihlstedt/Bossi family: Matthias, Tallulah, and Carla. Photo by Eurydice Galka. RRR has its own Twitter account and a Facebook page as well. Rabbit Rabbit Radio is a fascinating-yet-simple premise that feels very new, and fresh, and… cozy! Kihlstedt and Bossi both hope this kind of project takes off: “there are lots of artists whom we would gladly subscribe to ourselves!” While there may very well be other musicians out there attempting similar transmedia subscription services (and please feel free to give them a shout-out in comments, because we’d love to know more about them, too) it’s certainly not status quo quite yet. Fingers crossed that it soon will be. The modern quest for reasonable and sustainable alternatives to a more staid career path in the arts is always worth discussing on Coilhouse. We live in interesting- no, scratch that, fascinating times. It might feel daunting to watch the old regimes fall down around our ears, but there’s no doubt about it: we are lucky to be alive during a time period where there’s so much opportunity to build newer, better, kinder infrastructures. Let’s stay tuned in! From the same land that recently brought us Vinicius Quesada’s ominous post-apocalyptic images in the McDonald’s color scheme comes this two-image series from Brazilian artist Lucas de Alcântara. The strange atomic-age flying machines (robots? winged helmets? …life forms?) recall Leonardo da Vinci’s technical drawings, while the composition echoes high-concept, hand-drawn film posters of bygone days. The would look great on a wall next to some Takashi Itsuki prints, no? 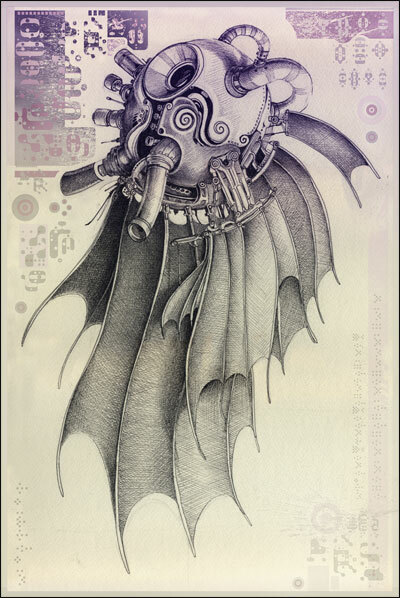 The images appear in Alcântara’s Depthcore portfolio. Consisting of digital artists around the world, Depthcore is a treasure trove of weird cyberpunk art. Work on Depthcore seems to be presented in chapters, and the image above appeared in the chapter titled Obsolete among many other beautiful submissions. 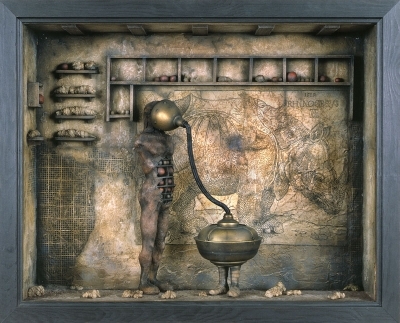 Spanish artist Oscar Sanmartin Vargas has a staggering portfolio of mixed media work, and ranging from dioramas, pharm to surreal architectural etchings, to detailed studies of alien biological specimens. 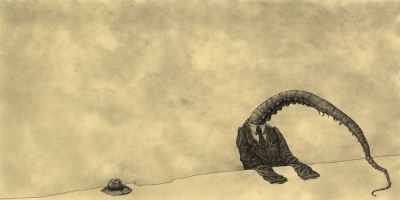 The drawings are especially haunting; all their subjects depicted under a perpetually overcast sky. In regards to those strange animals: he released a book in 2007, entitled Leyendario: Criaturas de Agua (Legendary Creatures of the Water), a video preview of which can be found below. I am completely smitten with these — the line work, the use of empty space, the mystery of them. They are simply wonderful. A quick Google search shows that this video is pretty much everywhere, but I just can’t resist putting it here. Following up their Star Wars themed Passat commercial for last year’s Super Bowl, Volkswagen returns this year, and once again puts “The Imperial March” to excellent use, in this case having it performed by twelve dogs, some in various forms of Star Wars costumery. It’s so very silly but I love it so very much; especially the grand entrance of the twelfth and final member of this canine chorus. So. Good. Korean artist Minjeong An’s oeuvre is varied but these self portrait diagrams stand out. 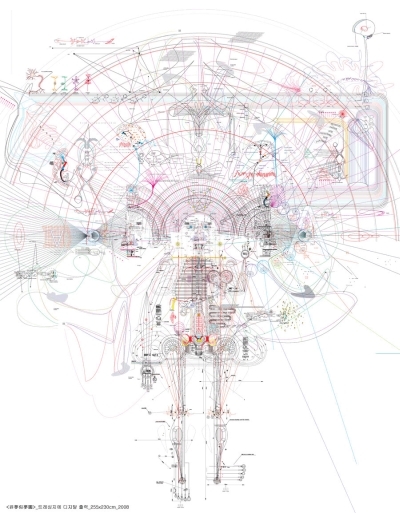 Mind-bogglingly detailed, they invite the viewer to fall into their complex webs of lines and labels. Visually they’re almost overwhelming, the lines seeming to shift between abstract patterns and strictly ordered plans. These you really have to check out on her site in high resolution, as our image sizing here doesn’t do them justice. “Two Against One” from the album Rome, a collaboration between Danger Mouse and Daniele Luppi, which came out last year. Featuring vocals by Jack White, it’s been supplied with a spectacularly hallucinatory video directed by Chris Milk and Anthony Francisco Schepperd. Just beautiful work. I’ll admit, I know very little about the Swiss, stop-motion cartoon Pingu other than that it is a Swiss, stop-motion cartoon about penguins. That does little to dampen my enthusiasm for this, a remake of John Carpenter’s sci-fi/horror classic The Thing by Lee Hardcastle, starring the adorable cast of the aforementioned cartoon and animated in the same style. It is just as good as it sounds. 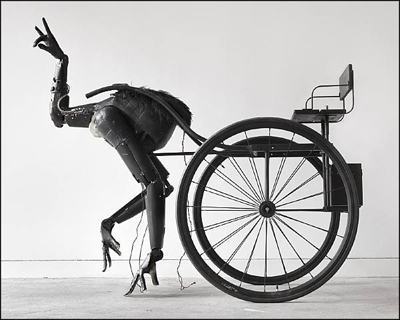 I seem to have completely missed this upon its release (and it may have been better posted around Christmas), but Cool Hunting has a short profile of Lou Nasti, whose studio, Mechanical Displays, who has done animatronic installations all over the world. His most famous might be various Christmas displays for storefronts on Manhattan’s 5th Avenue. Nasti (whose resembles Disney’s version of Mister Geppetto to such a degree that one would be forgiven for thinking it intentional) is the perfect type for this sort of piece: earnest and in love with his work. He oversees a shop stacked high with tools and parts, and toys. Admittedly, I have a penchant for these sorts of spaces, with their towering, organized clutter. They have a character all their own, often as interesting as the people who work in them.